The Olimpia chairs can be matched with the coffee table OLLY ("OUTDOOR TABLES" - "POLYPROPYLENE"). This particular structure allows the air passage on the backrest and on the seat. 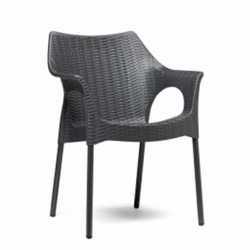 Its shape and the particular manufacture make it a product suitable for every environment, indoor and outdoor.